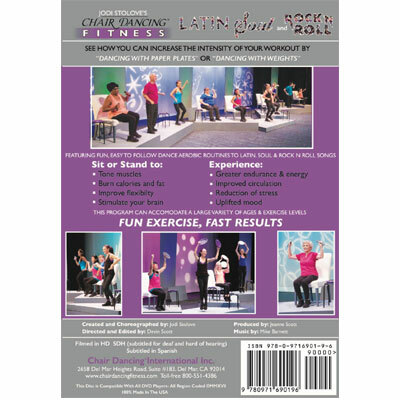 The DVD – Chair Dancing Latin, Soul and Rock ‘n’ Roll is a demonstrated standing and seated aerobics program. The dvd features easy to follow dance aerobic routines. The routines include seated exercises and standing formats set to latin, soul and rock ‘n’ roll enabling people of all ages and exercise levels to participate. Paper plates and light hand weights are also included in the routines for those who wish to work a little harder with added resistance. 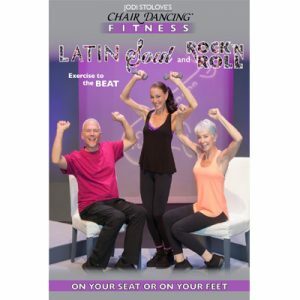 This American DVD program (region free) is a faster paced program than some of our other exercise dvds, and therefore best suited for active senior groups, retirement village seniors, and seniors living at home . For viewing on your large screen TV.